Showing My Family Love: Kickin’ the Chemicals OUT! 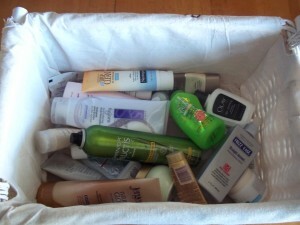 I have been replacing store-bought hygiene products with homemade alternatives. I am declaring war on the chemicals in our house! However, I have dirty little secret. I have a stash full of chemical filled hygiene products under the sink in my bathroom. I have not been using them but for some reason I have not thrown them out. Maybe because I am cheap. Today I have decided to take the plunge. I went into my bathroom with a basket and filled it up. Many of the product have never been opened. I am loading these products with a load of clothing to take to a donation center. I can’t bear to just throw them away…silly but true. So along with the candy, hugs, and kisses that I have given my family this Valentines Day I have given them another gift…a healthier house!